Commercially made all-purpose cleaners do a good job wiping away dirt and germs from your counters and appliances, but they leave behind chemical cleaning agents like alkylphenol ethoxylates (APEs), which do not easily break down in sewage treatment after they are washed down the drain. Studies have shown these chemicals to be endocrine disrupters. Since these products are as harmful to the environment as the grime they are meant to get rid of, I’ve started making my own all-purpose cleaner from all-natural ingredients. Here’s a recipe I like taken from the book, Green Clean. Mix all the ingredients and pour into a 16-ounce spray bottle. I’ve made a couple of batches of this cleaner and really like it. You have to use a little more elbow grease to rub away spills, but nonetheless it cuts grease and leaves my counters clean. I think this cleaner is cheaper than buying a “green” cleaner at the store because some of the ingredients, such as castile soap, borax and vinegar, can be bought in bulk and then used in multiple cleaning recipes. 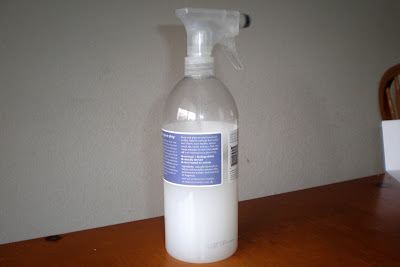 So my Thrifty Green Thurday tip of the week is to make your own all-purpose cleaner. Click here for more tips. I have a very similar recipe, which I use all the time. It works great. It has taken a while for me and my husband to learn that the "clean smell" is often to smell nothing at all (or the light scent of essential oils). We are all conditioned to think that "clean" smells like chemicals and artificial fragrance. I'm so glad my son will grow up knowing the difference. I to am starting to do these types of cleaning product. I'm also doing dishwasher soap and laundry detergent. Plus I found a recipe for soft scrub. By the way, we live in Colorad as well!! Thanks for sharing this. I'm going to make a batch this afternoon, since I'm nearly out of my vinegar and tea tree oil spray that I made last month. I wouldn't have thought to use borax, which I use in the laundry and toilet. I'm all for making your own eco-cleaners from scratch! So far I've just experimented with vinegar and water though so this recipe will take me further! Thanks for sharing your recipe with us this Thrifty Green Thursday! I'm researching blogs for a new Internet marketing campaign. Your blog popped up on my Google Alerts. Thought you'd like to know how I got here. Congratulations on going green. It’s better for you and the earth. For years, I used baking soda to clean my refrigerator. It left a residue and I never felt that it was really clean. I tried vinegar for general cleaning, but couldn’t stand the smell. Now I’ve found a green cleaner that I really like. I use it for everything – From washing fruits and vegetables to cleaning everything around the house. I even use it to wash the car. And the cost may be less than your homemade cleaner. I pay about 6¢ a quart. How does that compare to your cost? I haven't started buying borax yet... but I think I just might. I've used vinegar to clean & disinfect with... it's fun to get new ideas. I'm not very good at whipping up my own cleaning products but I do use all natural products. I don't know how anyone can use the chemical stuff! I really need to do this.....it's on my list of things to do to be greener! Where the heck do you buy borax.....can you get it at the grocery store?! Wayfaring Wanderer, I have seen Borax at my normal grocery store next to all the other detergents and cleansers. Thanks for this recipe. Like Joy, I haven't really gone beyond a vinegar-water solution, but maybe it's time to branch out! And thanks for coming back for Thrifty Green Thursday! For counter tops, bath tubs and showers I use a mix of 50/50 vinegar and water but for toliets I use the commerical stuff.